Home > Hindu Dharma > Deities > Shri Ganapati > What is the significance of ‘durva’ in Ganesh Poojan ? What is the significance of ‘durva’ in Ganesh Poojan ? 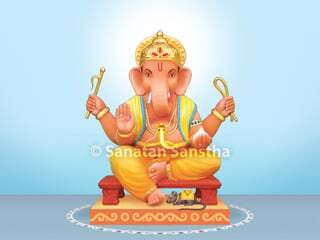 1.2 What type and how many Durva should be offered to Shri Ganesh ji? 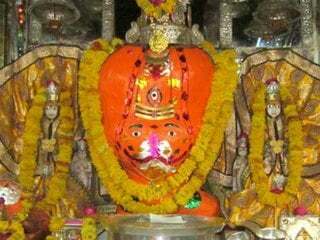 B) The Durva have the ability to absorb and emit the three Principles of Primal Shiva, Primal Shakti and Primal Ganesh. 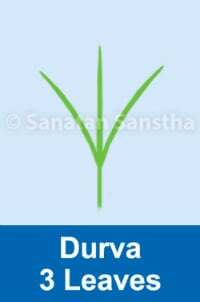 C) Durva have the highest ability to attract the Ganesh Principle. 1. The Nirgun Ganesh Principle and pure Chaitanya are emitted through the Durva in higher proportion. 2. The momentum of this emission is also higher. 3. The effect of the frequencies emitted by the Durva is on the subtlest, that is, most subtle level. 4. The effect of the frequencies emitted by the Durva is on the gross body, the subtle body and the causal body. Hence, Durva are offered to Shri Ganeshji. 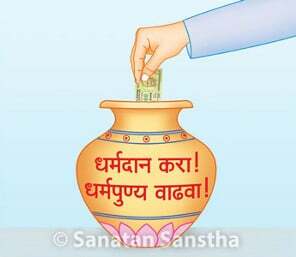 1.2 What type and how many Durva should be offered to Shri Ganeshji? 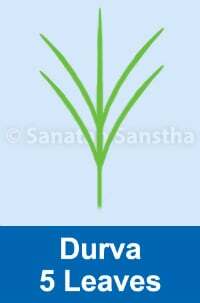 Generally, tender Durva shoots are used in the ritualistic worship of Shri Ganeshji. The blossomed Durva are not used in the worship. With the blossoming of the plant, its ability to attract the Ganesh Principle is reduced. Offer the Durva with three or five leaflets to Shri Ganeshji. They are called durvankur. The middle leaflet of durvankur attracts the Principle of Primal Ganesh and the other two leaflets attract Primal Shiva and Primal Shakti Principles. 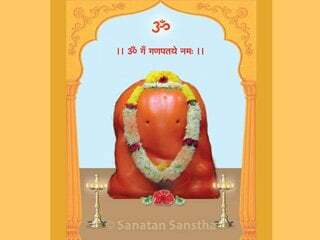 The minimum number of Durva to be offered to Shri Ganesh ji should be 21. Tie the Durva together and offer them to Shri Ganesh ji after dipping into water. 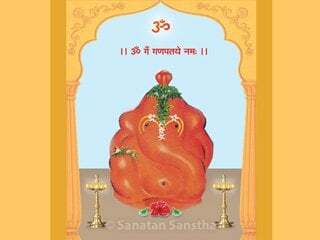 The entire idol of Shri Ganesh ji excluding the face should be covered with Durva. Thus the fragrance of Durva spreads around the idol. 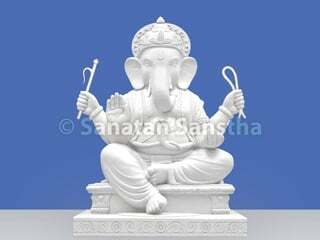 Shri Ganesh ji is ritualistically worshipped by offering a Durva with each utterance of the one thousand Names of Shri Ganesh ji. This is called ‘durvarchan’. In this the offering of Durva begins from the Holy Feet of Ganesh idol. 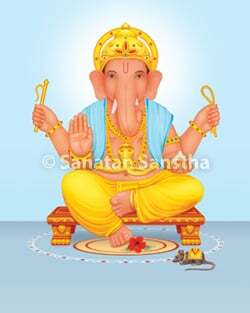 As a result of the durvarchan done in this manner, the Ganesh Principle is attracted to the venue of the worship in higher proportion. The Nirgun frequencies of Principles of Deities are attracted in the idol. 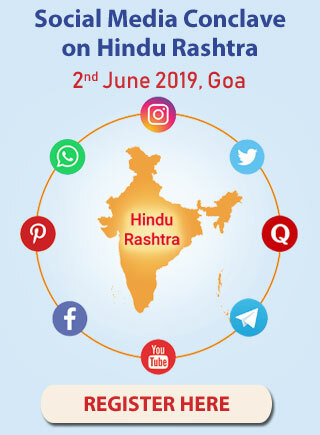 These frequencies are transformed into Sagun frequencies in Shri Ganesh idol and they are then emitted through the idol because of which the worshiper gets more benefit. It is thus clear that due to the emission of the Deity’s Principle through the Durva, the adverse influence of the raja-tama-predominant Principles in the environment is reduced. Durva have the highest ability to attract and emit the Principles of the three Deities – Primal Shiva, Primal Shakti and Primal Ganapati. The grass does not have any such ability. The vibrations that the grass attracts and emits are illusory, that is, artificial. A) Raja-guna is active in the roots of grass, which flows in outward direction. B) Due to the raja-guna in the grass, the illusory vibrations flow in it and are also emitted by it. If Durva is not available, the all-encompassing akshat, that is, unbroken rice grains smeared with kumkum should be offered to the Deity. The Scriptures mention: ‘सकलउपचारार्थे अक्षताम्‌ समर्पयामि।’ which means, ‘Akshat can be used in place of all the substances offered in the rituals’. 1. Select Durva grown in a clean place only. 2. The Durva should not have been trampled upon. 3. 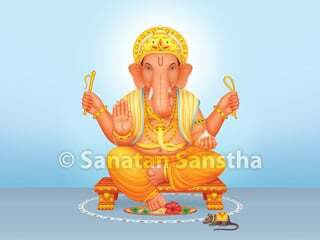 While plucking Durva, chant the Name of Shri Ganesh ji continuously. 4. While bringing Durva home they should not be held in the left hand or on the head. The three leaflets of the tri-foliage Durva to be offered to Shri Ganesh ji denote the three gunas, sattva, rajaand tama. If the bhav of the worshipper or the seeker is that ‘offering the tri-foliage Durva means offering our gunas', he gets the benefit at the spiritual level. 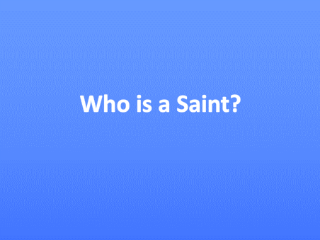 One can say that the sole aim of life of a person on the path of Spirituality is to contribute to the Divine mission by going beyond the three gunas. In short, one gets the learning from the Durva that, one should be in a state beyond trigunas and continue to perform the Divine mission with the help of the trigunas.